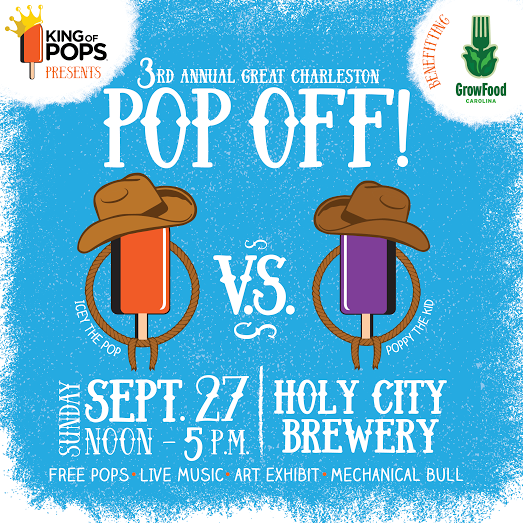 King of Pops is hosting its 3rd Annual Great Charleston “Pop-Off” and you're invited!! With our season coming to a close, we wanted to end it with one last hoorah for the heat by cooling off with free pops and fun for the whole family! This all-ages dog-friendly event will take place on Sunday, September 27th at Holy City Brewing from 12:00pm to 5:00pm following Bendy Brewski Yoga! Don’t miss the Sunday-Funday festivities, complete with live music by Red Cedar Review, free pops, a "Pop Art" silent auction, pop eating contest, and a mechanical bull from Charleston Fun Factory . All proceeds benefiting Growfood Carolina, what better way to spend your Sunday!